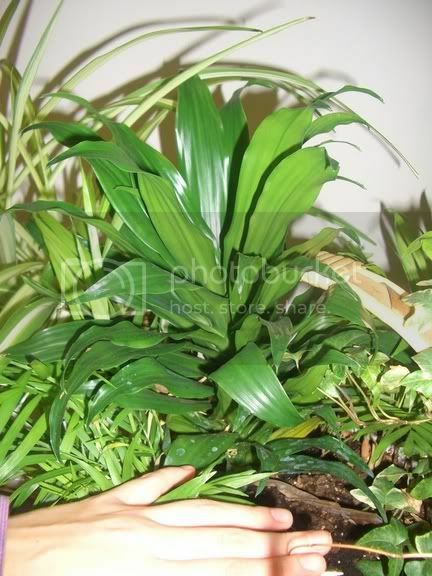 There is a Dracaena at work that I would like to take a peice of. I know that I snip the top off but I can't remember if I root it in water or if I stick it in some dirt... here's a pic for reference. It's in one of those basket dealie-o's but I am planing to separate most of these plants, I may leave some smaller ones together in the basket. I've had succes by sticking the cuttings in dirt. Can't remember if I used rooting hormone though. I probably did. Alrighty...I don't suppose it'll hurt to dab a little on it. Cheers! Someone else might have another opinion though, and different things might work. but ya, what i do is i just stick it in soil and water it sometimes and it grows lol.